PCRE (Perl Compatible Regular Expression) Search/Replace. GUI entirely customizable: minimalist, tab with close button, multi-line tab, vertical tab and vertical document list. Auto-completion: Word completion, Function completion and Function parameters hint. 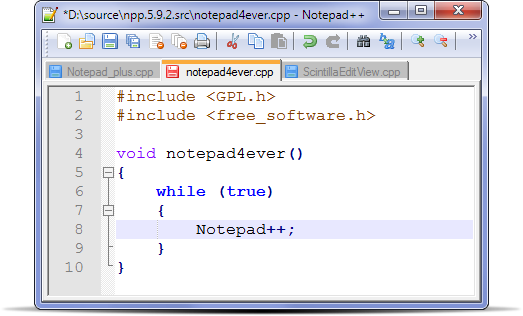 So, Notepad++ is a source code editor and MS Windows notepad replacement. It is based on a powerful editing component Scintilla. 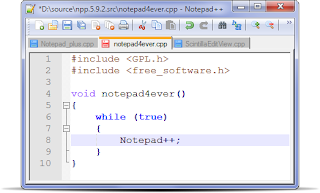 Notepad++ is written in C++ and uses pure Win 32 API and STL which ensures higher execution speed and smaller program size. It optimizes as many routines as possible, without losing user friendliness.